Residents learn about police crisis intervention and terrorism training – Welcome to Wyandotte Daily! 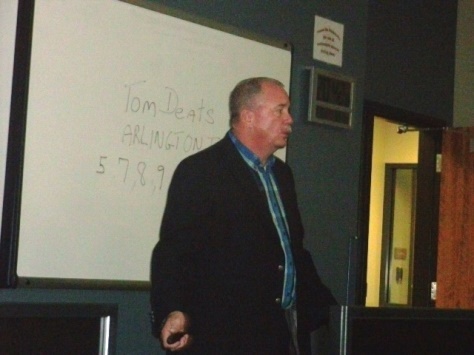 At the recent citizens police academy class, presentations were made on crisis intervention and terrorism. Capt. Doug Parisi gave a presentation on crisis intervention. 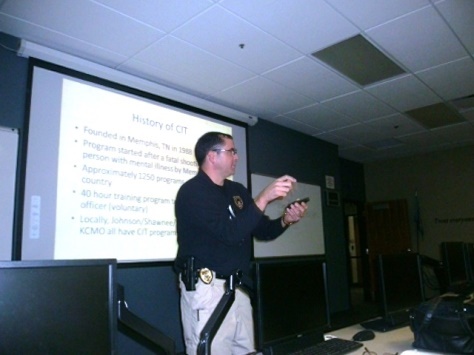 Crisis intervention involves how a police officer should deal with the mentally ill. It was not until recently that a program like this was started. It was first started in Memphis, Tenn., where a police officer shot a person who was mentally ill. Currently there are 1,250 crisis intervention programs in the United States. In the past, a person who is mentally ill would be put in jail. A person who is mentally ill requires a lot more attention than a person who is not. The average person only spends about one day in jail before they bail out of jail. The mentally ill person has a tendency to stay in jail a lot longer and they require a lot of attention, therefore costing the taxpayers more money. It costs the citizens roughly $50,000 a year just to house a person who is mentally ill when he or she is in jail. Wyandotte County has a lot of programs such as Rainbow House, a facility that can house someone on a temporary basis instead of leaving a person who is mentally ill in jail, saving the taxpayers a lot of money in the long run, said Capt. Doug Parisi. “We train an officer on crisis intervention; we teach them the proper approach,” he said. “In fact we currently have a therapist on call 24 hours a day in case that particular officer might need some advice on how to handle that person who is mentally ill. It is very hard for a lot of the officers to do this mainly because of the stress that the officers have to deal with on a daily basis. This is why we have such a program as this. We teach the officers to think outside the box,” Capt. Parisi said. The second presentation, on terrorism, was given by Detective Jim Bauer. “If you’re aware of anyone attempting to improperly acquire explosives, weapons, ammunition, dangerous chemicals, are you aware of anyone who does not appear to belong in the workplace, neighborhood or a key facility? You are to contact the police department immediately,” Detective Bauer said. All agencies in the Greater Kansas City metropolitan area work together on terrorism and constantly communicate. “I see the active terrorism happening more frequently. I answer directly to the deputy chiefs and police chief,” Bauer said. The terrorism task force number is 816-512-8200; it is sponsored by the Federal Bureau of investigation.